Objective: To describe the evidence supporting the central concept of the assessment and correction of vertebral subluxation as a core clinical objective of chiropractic practice and to identify a gap in the clinical evidence base that may inhibit greater unity around this central concept. Discussion: Assessment and correction of vertebral subluxation is a central theme in clinical chiropractic practice, embraced by the majority of the practicing profession and chiropractic students. Chiropractic patients report healthcare benefits beyond a period of therapeutic care and their presenting complaints. A potential gap has been identified in the body of clinical evidence supporting chiropractic care for the assessment and correction of vertebral subluxation. Documenting the assessment of commonly used and reliable direct indicators of vertebral subluxation pre and post chiropractic care or a clinical trial may serve to fill this knowledge gap. Conclusion: The assessment and correction of vertebral subluxation is a core clinical objective in the practice of chiropractic. Chiropractors in clinical practice, chiropractic educators, and chiropractic researchers are encouraged to address the identified gap in the evidence by documenting the common used direct indicators of vertebral subluxation used both in the initiation of care or a clinical trial and at each progress evaluation or post the completion of clinical trial outcome measurements. 1. Hart J. 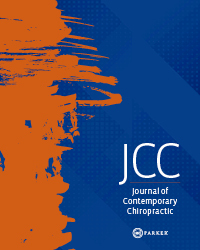 Analysis and adjustment of vertebral subluxation as a separate and distinct identity for the chiropractic profession: A commentary. J Chiropr Humanit 2016;23(1):46-52. 2. Good, CJ. Chiropractic identity in the United States: Wisdom, Courage and Strength. J Chiropr Humanit 2016;23(1):29-34. 6. Association of Chiropractic Colleges. The Association of Chiropractic Colleges Position Paper # 1. July 1996. . ICA Rev 1996;November/December. 11. Keating JC, Charlton KH, Grod JP, Perle SM, Sikorski D, et al. Subluxation: dogma or science? Chiropr Osteopat 2005;13:17. 13. Repka A, Ebrall P, Draper B. Failure to use vertebral subluxation complex as a diagnostic term: A flaw of reductionistic diagnosis with resultant compromise of student and patient outcomes in chiropractic teaching clinics. Chiropr J Aust 2007; 37 (3): 84-91. 14. Ebrall P. Towards better teaching about the vertebral subluxation complex. Chiropr J Aust 2009;39(4):165-170. 15. Stephenson RW. Chiropractic Textbook. Davenport, Iowa: Palmer School of Chiropractic; 1927. 16. Practice Guidelines for Straight Chiropractic. Paper presented at: Wyndham Conference; May 13-17, 1992, 1992; Chandler, Arizona, USA. 17. Lantz CA. The vertebral subluxation complex part 1: An introduction to the model and kinesiological component. Chiro Res J 1989;1(3):23-36. 18. Gatterman MI, Hansen DT. Development of chiropractic nomenclature through consensus. J Manipulative Physiol Ther 1994;17(5):302-309. 19. Leach RA. The chiropractic theories: a textbook of scientific research. 4th ed. Baltimore: Lippincott Williams and Wilkins; 2004. 21. Harvey M. Using chiropractic philosophy to deliver relevant research: The example of the Australian Spinal Research Foundation grant funding process. Chiropr J Aust 2010: 40 (4); 151-153. 22. Senzon SA. Constructing a philosophy of chiropractic I: an Integral map of the territory. J Chiropr Humanit 2010; 17:6–21. 29. Nelson C. The subluxation question. J Chiropr Hum 1997;7:46-55. 30. Haavik-Taylor H, Holt K, Murphy B. Exploring the neuromodulatory effects of vertebral subluxation. Chiropr J Aust 2010;40:37-44. 31. Gatterman M, Hansen D. Development of chiropractic nomenclature through consensus. J Man and Phys Ther 1994;17(5):302-309. 33. Villanueva-Russell Y. Caught in the crosshairs: Identity and cultural authority within chiropractic. Social Science & Medicine 2011;72(11):1826-1837. 35. Policy Statement by Chiropractic Australia regarding the Vertebral Subluxation Complex. 2015; ChiropracticAustralia.org.au. 44. Biggs L, Hay D, Mierau D. Canadian chiropractors' attitudes towards chiropractic philosophy and scope of practice: implications for the implementation of clinical practice guidelines. J Can Chiropr Assoc 1997; 41(3): 145-154. 46. Hurwitz EL, Coulter ID, Adams AH, Genovese BJ, Shekelle PG. Use of chiropractic services from 1985 through 1991 in the United States and Canada. Am J Public Health 1998; 88:771-776. 50. Pham MT, Rajic A, Greig JD, Sargeant JM, Papadopoulos A, et al. A scoping review of scoping reviews: advancing the approach and enhancing the consistency. Res Synth Methods 2014 Dec; 5(4): 371–385. 53. Owens E. Chiropractic subluxation assessment: What the research tells us. J Can Chiro Assoc 2002;46(4):215-220. 58. Cooperstein R, Gleberzon BJ. (2004). Technique systems in chiropractic. Elsevier Health Sciences. 60. Cooperstein R. Technique system overview: Thompson Technique. Chiropractic Technique 1995; 7(2):60-63. 61. Rosen MG, Blum CL. Sacro Occipital Technqiue: Technique and analysis. Today's Chiropr 2003; 32(22):24-26. 69. Alcantara J, Ohm J, Kunz D. The safety and effectiveness of pediatric chiropractic: a survey of chiropractors and parents in a practice-based research network. Explore 2009; 5: 290–295. 92. Holt K, Haavik H, Chi Lun Lee A, Murphy B, Elley R. Effectiveness of chiropractic care to improve sensorimotor function associated with falls risk in older people: A randomized controlled trial. J Manipulative Physiol Ther 2016; 39(4): p. 267-278.